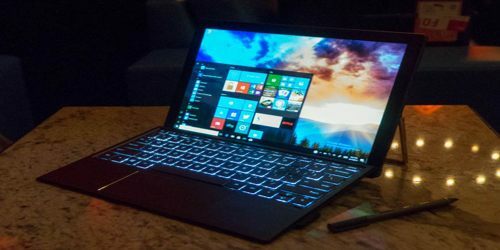 With HP’s signature elegant, thoughtful design, the 2017 Spectre x2 two-in-one has a lot to recommend it in comparison with the now iconic Microsoft Surface Pro. 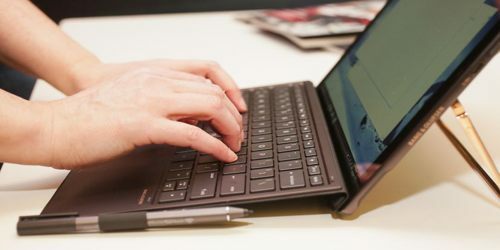 Advantages include a more solid feel when typing or inking — with the bundled keyboard and stylus — and a 12.3-inch display with a denser pixel pitch, thanks to its 3,000×2,000-pixel resolution. And it’s much cheaper (for a comparable configuration), making it a better buy, as long as your needs don’t run to serious creative work, speed or long battery life. Nothing drastic has changed between the 2017 Spectre x2 and the previous version of the product, which arrived in early 2016. Overall weight has dropped a few ounces since 2016, but just a fraction of a millimeter has been shaved off of the still 8mm-thick width (14mm with the keyboard attached). HP says battery life has been improved by 15 percent (it’s now a bit over four hours. If user were to look at an HP Spectre x2 in silhouette, they would find that not much at all has changed. 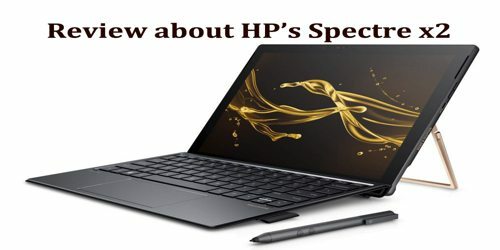 Turn on the lights, though, and user will know that HP has, again, brought this Spectre into HP’s new design language. That means a more matte, Ash Silver aluminum frame is now met with golden chrome accents aplenty, namely that of the kickstand. Speaking of which, HP’s stainless steel hinge design is now improved, making it much easier to open and close through magnets. The entire Spectre x2 package comes in a slick, 2.49-pound chassis that’s just 0.52 inches thin, making it awfully portable, which should be expected at this point. This year, HP has doubled down on USB 3.1 Type-C with two ports joined by a headphone/mic jack and microSD card slot, letting 802.11ac Wi-Fi and Bluetooth fill in the rest. The Spectre X2’s screen is also a significant leap over that of its 1080p predecessor. 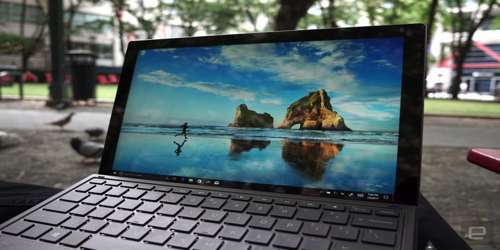 The 12.3-inch display packs in a 3,000 x 2,000–pixel resolution, amounting to 293 pixels per inch. The X2’s display looks good when viewing photos, text and movies. The X2’s display is also bright enough to use in direct sunlight, although user have to deal with plenty of reflections, thanks to its glass screen. HP has given its included keyboard cover a similar visual makeover, changing little else, which isn’t a knock in the slightest. Keyboard travel remains relatively deep and feedback satisfying, with bright backlighting too boot. 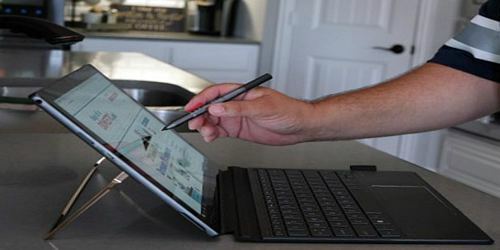 Also included is HP’s new, low-fi take on the stylus, simply known as the Active Pen, going off of Microsoft’s design spec and naturally supporting Windows Ink. The stylus is a more generic approach than previous proprietary offerings, but tracks just fine for general use. The IPS panel is a delight to look at, embodying all of the benefits of the first-assumed weird aspect ratio and such a drastic increase in pixels from 1080p. HP even managed the shrink down the bezels on the tablet’s left and right side, keen to leave the infrared (IR) webcam where it belongs, above the display. The Spectre x2’s battery life of about seven hours is lackluster. It’s a step up from the older Spectre x2, but we’d like to see this number climb a bit higher. Battery life is simply too important for a mobile device. 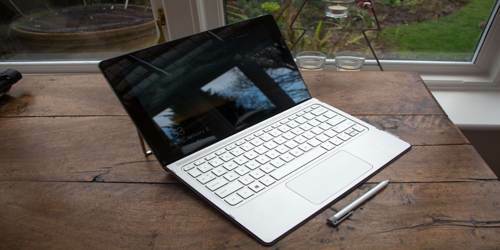 The Spectre X2 starts at $1,150 with a seventh-generation Core i5 processor, 8GB of RAM and a 128GB SSD. And don’t forget, that includes a keyboard and stylus. The two cameras include a 13MP rear one for those who like to take photos and videos with their tablets. A 5MP wide-view front-facing camera does a fine job for Skype, and there’s an IR camera to supplement the optical camera for Windows Hello. HP’s Spectre x2 includes several additional apps beyond the normal Windows selection, including HP-authored software. Some step in and replace Windows functions with HP’s own UI, such as the HP Pen Control for configuring the buttons on the included stylus. HP JumpStart provides tips, tricks, and a tour of the tablet. On the lighter side, HP also preinstalled games—the ubiquitous Candy Crush Soda Saga, Royal Revolt 2, and Sling. Other apps include Twitter, Netflix, and the Keeper password manager, plus a trial of McAfee LiveSafe. Finally, the Spectre x2 bundles Microsoft Office desktop apps, which user will need to enable with the one-month Office 365 trial or their own subscription.